ArkStar Kidz Club started out as a social and leadership club for youngsters to interact in a fun and educational environment, through a variety of activities at monthly rallies. The rallies of the social club continue, with activities ranging from horse riding and hiking to sleep over camps, outings and more. 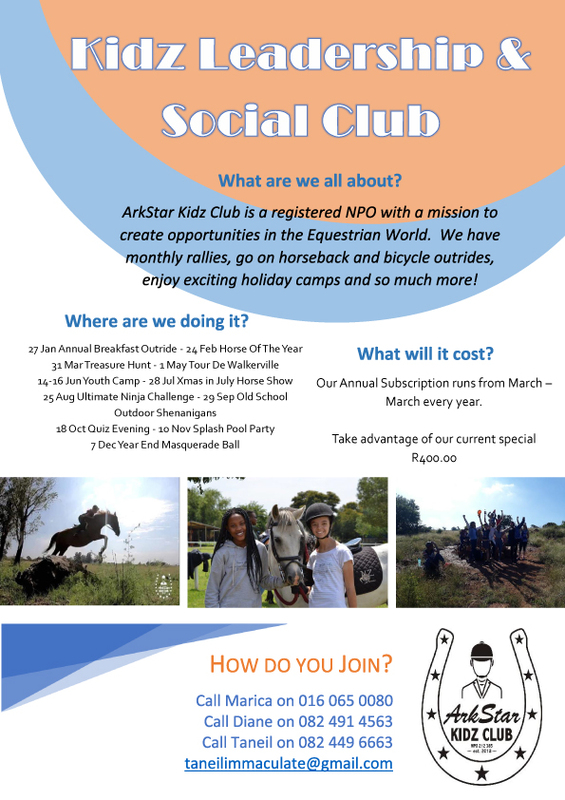 In March 2018 the club evolved into an officially recognized NPO (Non-profit Organization) with a mission to create opportunities in the equestrian world. The opportunities created by ArkStar include bursaries to attend Grooms training (including taking the EQASA exams to become certified), bursaries for children to attend The IEA Elite (an academic tuition center where horse riding is the academy’s sport), and sponsoring young riders to be able to compete at equestrian competitions at a national level where they would usually not be able to afford it. Monthly rallies held over the weekend include Friday night social interactions, Saturday or Sunday activities encouraging leadership through horse riding, team building games and educational outings as well as full weekend sleep over camps to build strong lifelong friendships. Membership fee R400.00 per annum. Year runs from March to March.